Long time ago, the rabbit was regarded as a big hunter. He lived with his grandma in a cabin somewhere in the woods. It was winter and just like other hunters, the rabbit set traps and snares to catch other animals for food. He got number of such small animals and birds through his well-laid snares. However, one day he realized that someone was stealing the animals from his traps. Every morning at the crack of dawn, he went to check his traps, and he found them empty. Soon the rabbit and his grandma became ravenous due to lack of food. At first, the rabbit was under the impression that the thief might be a clever wolf. However, this thought soon changed, when he discovered one morning, long, narrow footprints beside his traps. The first thought that came into the mind of the rabbit was that of the thief. However, when examined closely, the tracks appeared to be moonbeams. Since then, the rabbit woke up an hour earlier hoping to catch the thief. However, the thief was always a few minutes ahead of him, and had taken all the trapped animals. The rabbit then laid a cunning trap with a bowstring, and he was sure that he would catch the thief. He kept one end of the string and hid behind the bushes, so that he could watch if any animal was caught in his traps. There was a full moon when he set the trap up. Suddenly, the moon disappeared and everything became dark. There were a couple of stars that were sparkling and there was no mist in the sky. The rabbit began to ponder what had happened to the moon. 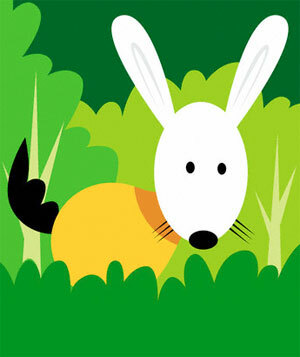 The rabbit then saw something move stealthily through the trees, and was suddenly blinded by a flash of brilliant white light. The light went straight to the trap that he had set. At once, the rabbit tugged on the end of the bowstring and tried to tighten the noose. There was a struggle and the rabbit immediately knew that he had caught the thief. The rabbit quickly fastened the bowstring to a nearby tree and rushed home. He wanted to tell his grandma what had happened. So the rabbit returned to his trap to find out who the thief was. However, when he reached his trap, the rabbit saw that the bright light was still present. The light was so bright that it hurt his eyes. Therefore, he went to the nearby brook to wash his eyes and cool them. The he made huge snowballs and threw it at the light to put it out. However, no sooner, it hit the light, they fizzled out. Next, the rabbit took some dirt from the stream and made some mud balls. Then he threw these mud balls with all his strength at the bright light. He was a decent shot and as soon as it hit the light, his prisoner yelled. The rabbit went closer and noticed that his prisoner’s face had been dirtied with all the mud balls that the rabbit threw at him. “I shall kill you and the entire rabbit tribe, if I am not set free,” threatened the moon. The rabbit was terrified to the point that he rushed back to inform his grandma about his strange and interesting prisoner. Although a wise, old rabbit, she too got afraid when she heard her grandson’s tale. “There is one more precondition,” said the rabbit. “Be quick with it, you stupid animal,” said the moon-man. “Promise me that you will never return to earth,” asked the rabbit. The moon-man agreed to both the conditions. The rabbit could scarcely see in the amazing light, in spite of which he somehow chewed through the bowstring and set the moon-man free. The moon soon disappeared, leaving a flash of light behind him. The bright light had almost blinded the rabbit and his shoulders were severely singed. Even today, rabbit’s eyes flicker as if the light is too strong for their eyes. Their eyelids are pink, and their eyes water if they stare at a bright light for some time. Their lips and nose jerk, recounting the rabbit's dread. Since that day, the man from the moon has always stayed away from the earth. Whenever he lights the world, one can see the signs of the mud that the rabbit threw on his face. At times, he vanishes for a couple of nights, when he is attempting to rub the signs of the mud balls from his face. At that point, the world is dark. However, when the moon man returns, one can see that he has never possessed the capacity to clean the mud marks from his sparkling face.